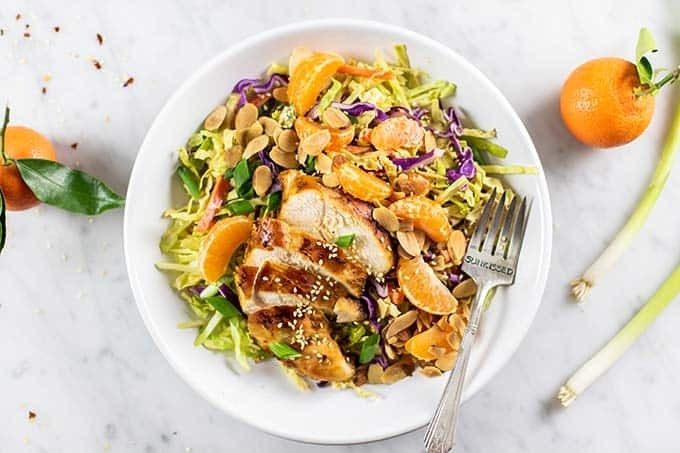 The perfect Whole30 Chinese Chicken Salad, loaded with crunchy cabbage, carrots and toasted almonds. 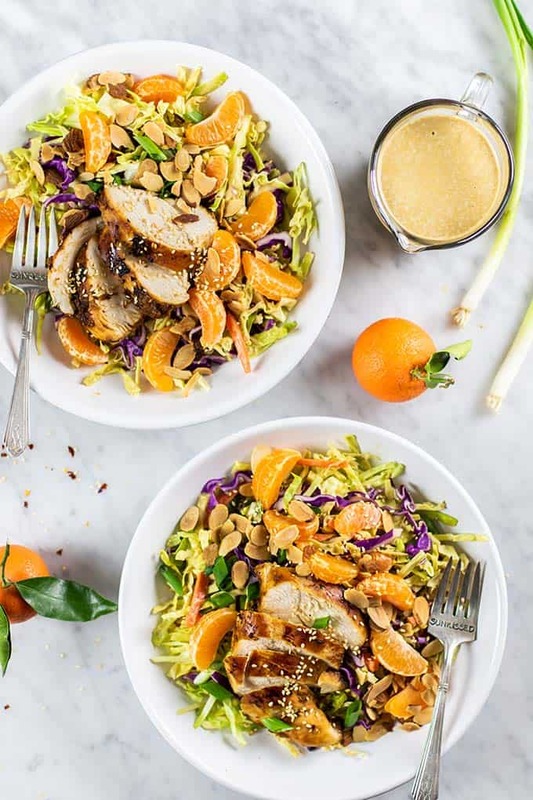 This tangy and sweet salad is made with a creamy sunflower butter dressing, and topped with ginger marinated chicken. I have been hooked on Asian Cabbage Salads for years. Something about all the crunchy, and the super flavorful dressings. Since doing the Whole30 a couple of years back, I have been a lot more conscious of even the small amounts of sugar I add to things like dressings and sauces. There are a lot of creative ways to make “sweet” dressings without actually adding sugar. Using more healthy fats is one of them. This dressing has a base of my favorite nut butter — SunButter. 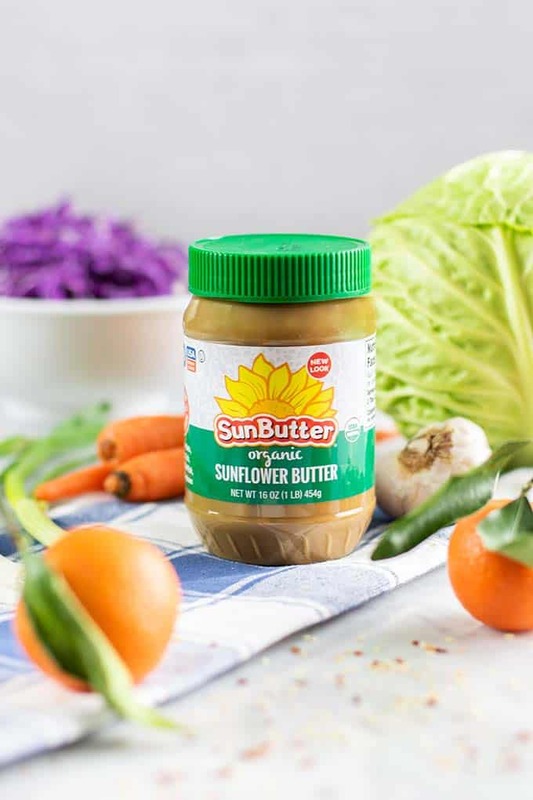 This creamy sunflower butter spread comes in two unsweetened varieties — the No Sugar Added, and the Organic. Both will work in this dressing! I love SunButter because it’s safe for peanut allergy sufferers (like me! ), and also full of healthy fats and protein. I use it often on the Whole30 — spread on celery with a few raisins is an easy and delicious breakfast! The sugar free varieties are a great treat to help stave off sugar cravings! Fresh grated ginger for a nice, flavorful kick. How Do you Make Chinese Chicken Salad? I adore cabbage salads. They are simple to make, and they last for days. This one only gets better as it sits in the refrigerator for a couple days, making it ideal for making ahead of time or meal prep. After preparing your asian cabbage salad dressing, chop the cabbage, and julienne the carrots. You can also shred the carrots, but since this version is Whole30, it doesn’t have crunchy noodles in it, so the thicker cut carrots add some extra texture. Toss the salad ingredients in the dressing, and set it in the fridge until the rest of the ingredients are ready. Honestly, if you can toss the cabbage in the dressing the day ahead, it will be that much better! Marinate the chicken in coconut aminos and ginger. This can be done 20 minutes or up to a day ahead. The coconut aminos have great flavor, but aren’t as strong or as salty as soy sauce, so I boost the flavor with a little sea salt as well. Toast the sliced almonds until they are golden brown — this really adds a nice crunch and texture, as well as making this salad more satiating. If you need to use a nut-free alternative, crunchy sunflower seeds would also be a great addition! Peel mandarin oranges and add them right before serving. Grill or pan fry the chicken when ready, and assemble the salads! I adore salads like this that are easy to make ahead. This is ideal if you are doing the Whole30, or are just looking for healthier recipes that pack well for lunches. This salad will have you craving your packed from home lunch! 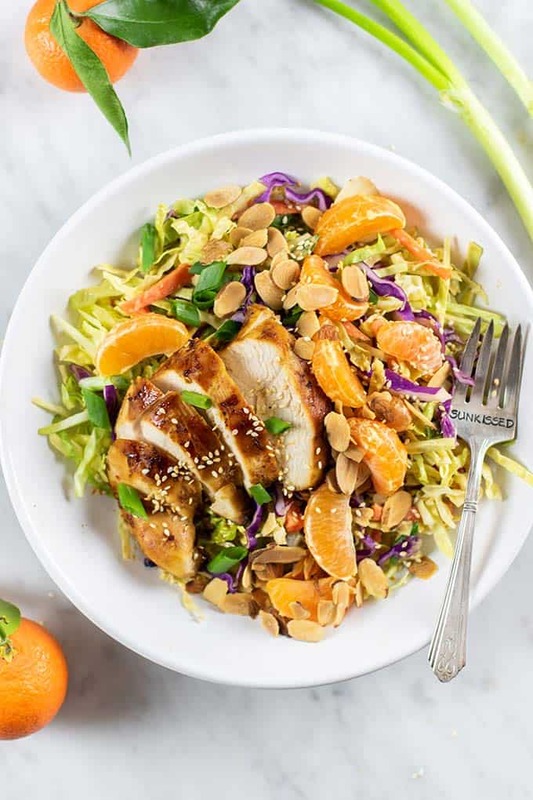 A vibrant and crunchy Chinese Chicken Salad, kept extra clean for the Whole30. This salad has natural sweetness and tons of crunch! It keeps well refrigerated for days, so is ideal for meal prep. Add all ingredients for chicken together in a bowl, and put in the refrigerator for 1 hour to marinate. 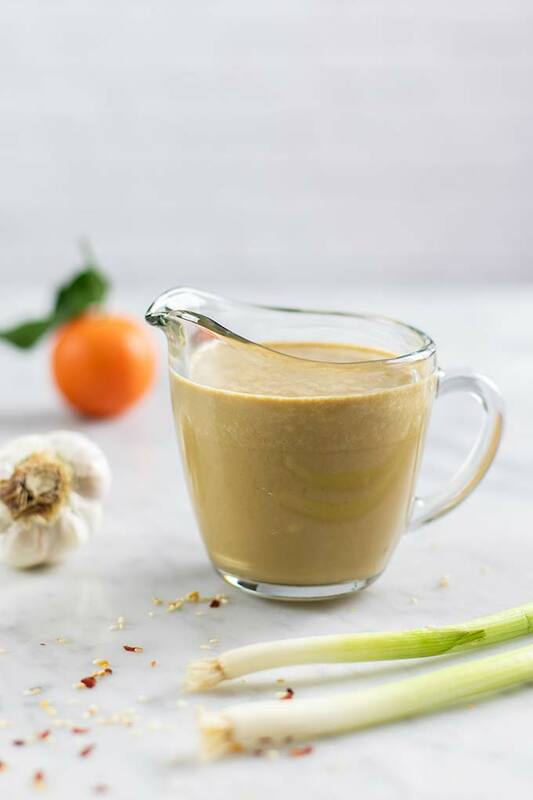 Add all ingredients for dressing to a blender, and process until smooth and creamy. In a large mixing bowl, combine cabbage and carrots. Toss in dressing. Grill or pan fry chicken until cooked through. 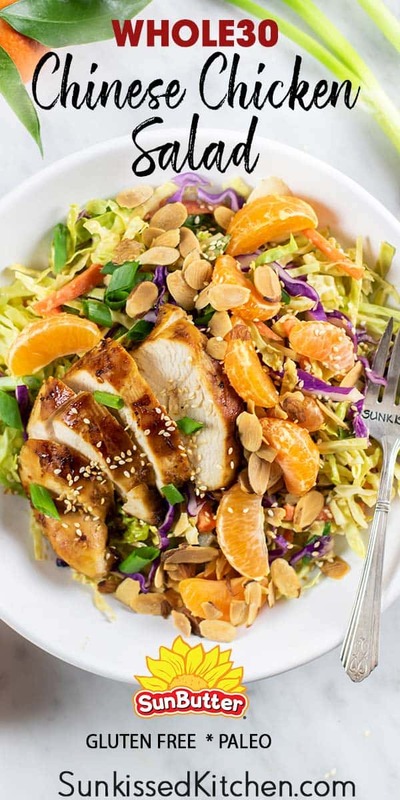 Add salads to plates, and top with chicken, green onions, mandarin oranges, and toasted almonds. 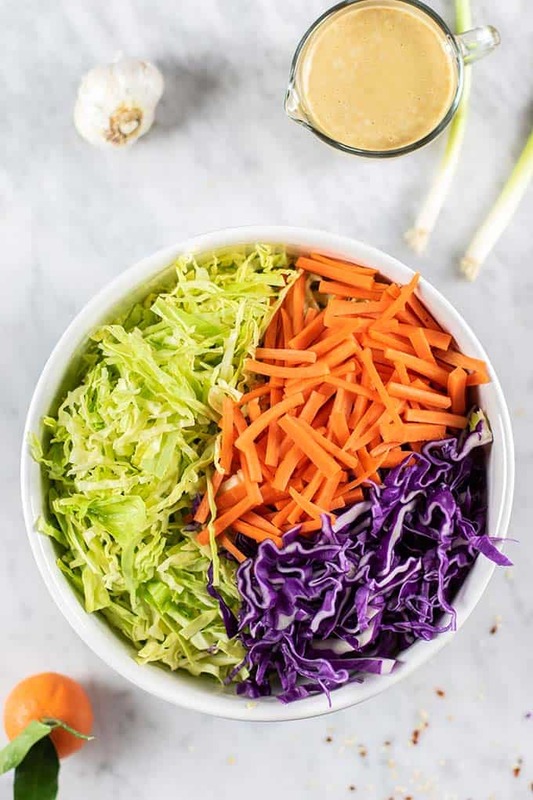 If meal prepping this salad, toss the cabbage and carrots in dressing, and then store the other ingredients separately until ready to serve. 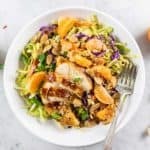 This Whole30 Chinese Chicken Salad post may contain affiliate links, meaning if you make a purchase, I will receive part of the sale as a commission. This helps me continue to bring you lots of fresh and inspired recipes! This salad looks incredible! I am just so thrilled to try the dressing. Sounds like a perfect treat. Thanks and recipe saved. It is a great recipe! So glad to hear you're saving it!